Traveling to Europe on your own or with your family on a vacation can sometimes give you a pre-vacation challenge with all the documents and requirements needed to obtain a Schengen visa. One of the main areas of confusion for most applicants is the ‘means of subsistence for Schengen visa.’ You’ve been told to carry a certain amount for covering the daily expense on your trip, but you could be unsure what are the costs that this amount includes. Will it include your hotel bills, flight charges, or transportation charges that you have already paid for? Do you have to show the proof of sufficient financial means if you’re traveling as a family? Some of the most commonly asked questions that can lead to further confusion are that how much travel money to show for the visa application? How much money do I need to have in my bank account for the visa? How much money do I need to show for Schengen visa? What should be the minimum bank balance for Schengen visa application? What is the amount that the Embassy expects to see in terms of means of subsistence? If you’re having such confusions, fret not! 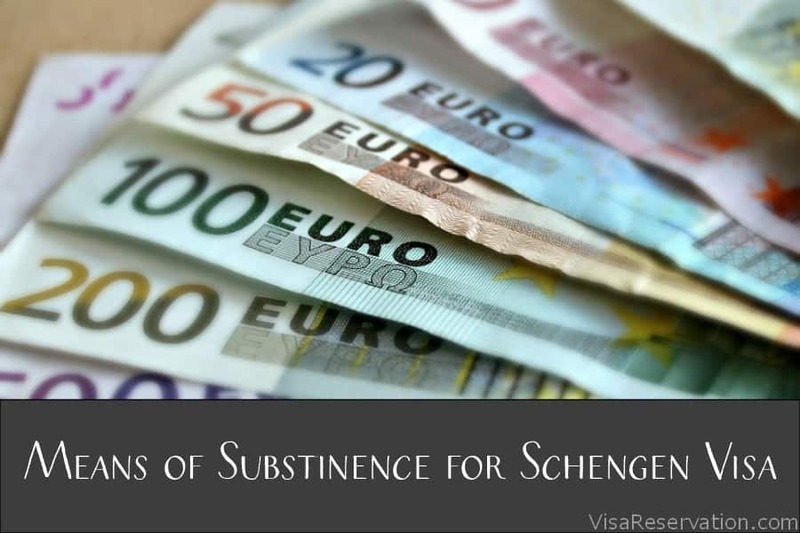 This article gives you a complete idea of what the means of subsistence for Schengen visa actually means and how much money do you need to consider for your trip to the Schengen area. What do you mean by means of subsistence for Schengen visa? 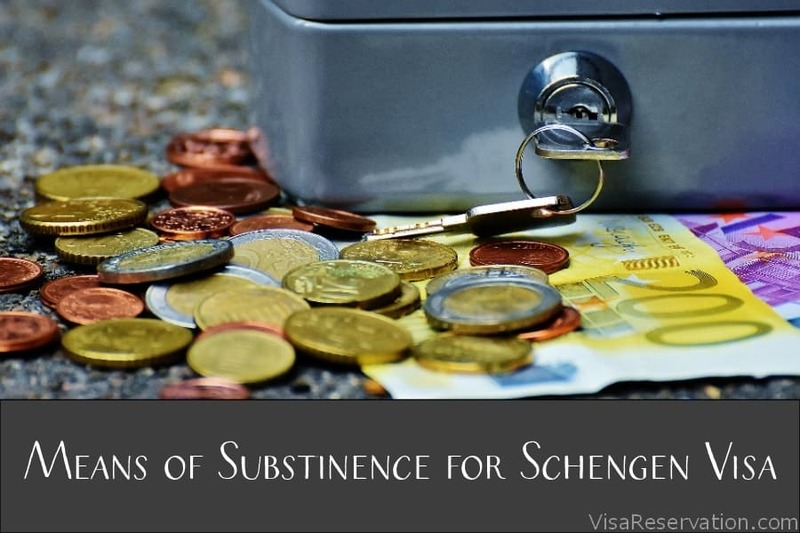 The means of subsistence for Schengen visa is also known by other terms such as proof of financial subsistence, proof of sufficient funds, financial sufficiency to bear existential costs. As the name itself suggests, it is a proof to show the respective embassy that you have enough funds to complete a round-trip of the country/countries while managing to stay without requiring any further financial assistance from anyone else. If you’re traveling alone, the cost is pretty straightforward. However, if you’re traveling with a family, the means of subsistence for Schengen visa may appear to be quite confusing. Don’t worry, a family trip abroad is a very common thing, and you don’t have to show each person’s individual means of subsistence. It can be paid by a single household. All you need to do is enclose a letter stating that you are traveling with a family and mention the names of all the family members traveling along with you. This will allow the consular office to cross-check the details and verify that you’re traveling as a family. How do you prove your financial sufficiency or show proof of sufficient funds? 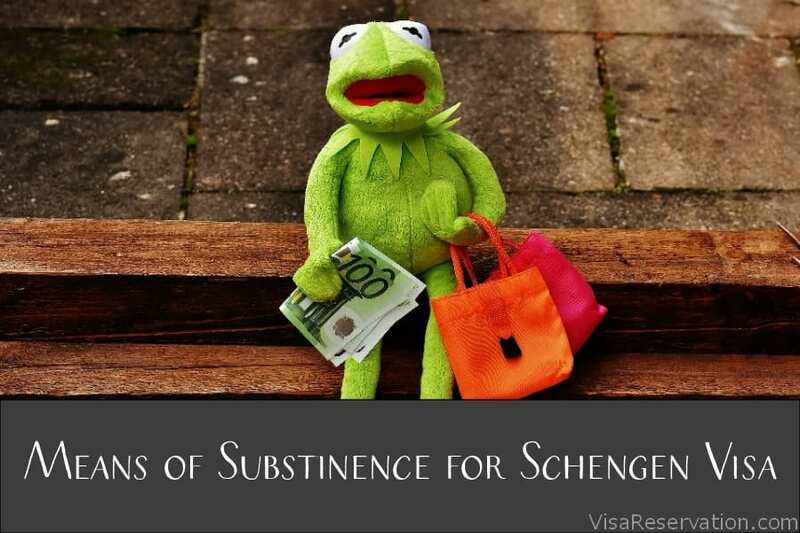 How do you calculate the means of subsistence for Schengen visa? You need to prove that you have the sufficient funds to bear the existential cost for each day of your trip. It can be calculated by multiplying the amount set by the country for each day by the number of days you will be staying there. The daily cost of subsistence in each country differs. For calculating the means of subsistence for Schengen visa, the Embassy websites of various Schengen area country have provided the exact amount, while some other have not disclosed the figures. For the updated information, you can check the official embassy website of the Schengen country you’re visiting. Here’s the snapshot of different countries means of subsistence requirements. Means of Subsistence for Belgium Schengen Visa €45 per day for aliens staying with a private individual; €95 per day for aliens staying at a hotel. Means of Subsistence for Croatia Visa €100 per day; but €50 for aliens possessing a certified guarantee letter, a proof of paid travel arrangements, etc. Means of Subsistence for Germany Schengen Visa €45 per day in the form of cash, credit cards and cheques but alternatively a letter of guarantee from the host. Means of Subsistence for France Schengen Visa €120 per day if holding no proof of accommodation; €65 per day if staying at a hotel; €32.50 per day if holding proof of accommodation. Means of Subsistence for Hungary Schengen Visa HUF1000 per entry or letter of invitation, confirmation of accommodation or any other credible proof. 20+ days €206.58 fixed sum + €27.89 per day (€118.79 + €17.04). Means of Subsistence for Poland Schengen Visa PLN 300 for the stay not exceeding 3 days; PLN 100 per day by stay exceeding 3 days; PLN20 per day if the cost of the stay were paid. Means of Subsistence for Spain Schengen Visa €583.74 minimum amount (for stays of up to 10 days); €64.86 per day in excess of 10 days. Note: This information is just for information purposes only. Please refer to the updated requirements of the respective embassy or consulate applying at for the latest information. What are the main metrics used for calculating the sufficient funds? Staying with a private individual: If you have friends or family members in the main Schengen country to which you’re applying for a visa, you have the option to stay with them. However, that does not mean, you are exempt from providing any means of subsistence. There are still other charges that need to be borne by the visitors for each day. Staying in a paid accommodation: If you’re planning to stay in a paid accommodation, you need to consider the charges for each day, which includes the per-night cost of the paid accommodation. In this scenario, regardless of which hotel you’re looking to lodge in or how much is the per-night cost for that hotel or hostel, most Embassies have already decided on the minimum cost per day inclusive of your paid accommodation. Cost per day excluding your paid accommodation: Unlike the previous one, in case you have already booked a paid accommodation, you can exclude that cost from the total cost per day. This cost would then be similar to the cost you have to bear when you’re staying with a private individual. This article should clarify most of the rudimentary doubts you had about the means of subsistence for Schengen visa. However, if you have any further confusions, simply let us know by getting in touch using our contact page. Since you’re applying for a Schengen visa, you may need to get certain other documents, such as a travel insurance or hotel reservation for visa. Visa Reservation can help you in obtaining these documents at a nominal cost and at the quickest turnaround time, while also assisting you with all your visa-related queries. This way, you can enjoy your pre-trip days without any worries!